Years later, despite his lack of formal training, Marcus Stone was given the opportunity to illustrate an edition of Our Mutual Friend (1865), Great Expectations (1862), a later editionof A Tale of Two Cities, as well as several other works by Dickens. Marcus Stone eventually gave up book illustration and, like his father, became an accomplished painter whose works were in high demand. 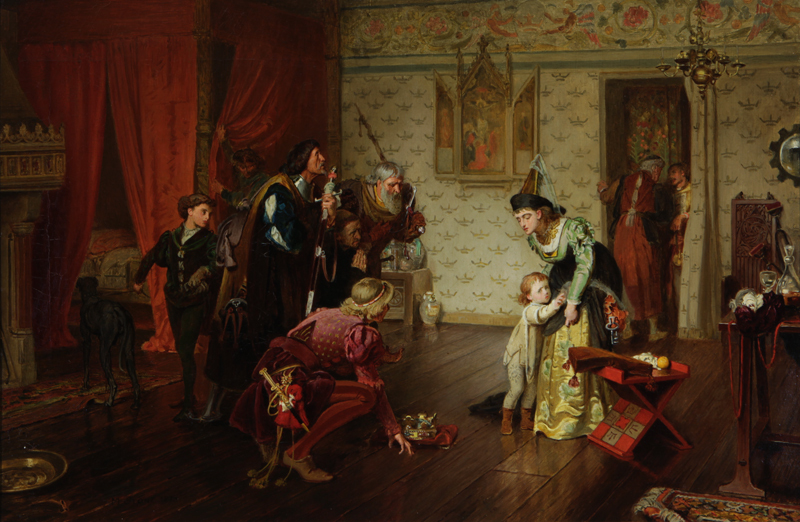 Especially noteworthy are Marcus Stone’s images of scenes from Shakespeare’s plays. Although both father and son exhibited their paintings at the Royal Academy, the elder Stone was merely an Associate of the Royal Academy, whereas Marcus’ superiority in painting earned him the full status of Academician at the Royal Academy in 1887. Marcus Stone exhibited his first painting at the Royal Academy in 1858. Le Roi est mort, Vive le Roi! was shown at the Academy in 1873 and Stone was elected an Associate of the Royal Academy a few years after this painting. Le Roi est mort, Vive le Roi! or “The King is dead, long live the King!” is a traditional phrase that is proclaimed on the appointment of a new monarch. The (former) king is dead! Long live the (new) king! The literal meaning is that the king has died, and it is hoped that the new king will live a long time.